The version provided here is in letter-sized landscape format, which is half-sized of the version I created in GIS. The version I drew was in tabloid format, and I printed versions on 11 X 17 inch paper for lamination. When we get our new kiosk installed this summer, I'll post a large-sized version there. The 2010 georeferenced air photo is provided free by Wisconsinview.org and is the key to this management map. Although anyone can download this photo, it is unfortunately in MrSID format and hence not viewable in Photoshop or any normal photo program. MrSID (pronounced Mister Sid) is an acronym for multiresolution seamless image database, and is a file format developed by LizardTech for encoding georeferenced raster graphics such as orthophotos. If you don't have ArcGIS, a MrSID viewer can be downloaded free from the U.S. Library of Congress. (The Library of Congress uses the MrSID format for its maps.) Wisconsinview.org is a free web site run through the UW-Madison Space Science and Engineering Department. We make considerable use of our management map, since it helps us keep track of where we have worked. Even with GPS, it is very useful to be able to use the management units to help us close in on an area we are working on. After a while, these management unit numbers become like old friends. The advantage of the new version is that it is more accurate than the older one (which was based on an air photo but without the Waypoints and Tracks positions). For instance, the positions of the fire breaks, roads, overlooks, and parking places are based on GPS coordinates. I finally found time to put together a summary of the tree database we finished a few weeks ago. Thanks again to Heisley and (especially) Amanda for their hard winter work on this. Trudging around in deep snow is not the best way to train for a Marathon. As the table shows, we have over 4000 trees, although some of them are present in only small numbers. The principal species are bur oak, white oak, red oak, and black oak, with lesser numbers of birch, cherry, hickory, Hill's oak, basswood, and black walnut. I should emphasize that these counts are what is there at present, after more than ten years of restoration. When we started, the percentage of oaks was a lot lower. How important is it to eradicate "all" bad guys? The days are starting to get longer and there are tiny glimpses of spring in the air. On a south-facing lawn I saw bits of green grass sticking out. This is the time of year when one starts to think about planning for the upcoming season. I just finished the prescribed burn plans for Black Earth Rettenmund Prairie and Pleasant Valley Conservancy State Natural Areas. If one is thinking of the long term, the answer to this question is "Yes". The reason? Because annual stewardship cannot be assured. All sorts of reasons might arise that would prevent continued restoration on a preserve. Money problems first come to mind, but passing on or moving away of key personnel may be more important. What happens if work is stopped on a site before it is completely cleared of bad stuff? In a few years, bad plants will start to appear, and in a few more years there will be more. At first these "stragglers" may seem acceptable, but this is just what microbiologists call the "lag" phase. Eventually the "log" phase is reached, and the site will suddenly "explode" with invasive plants. With exponential growth, it is the last doubling that turns the site from tolerable to hopeless. One year the site may look more or less OK and the next year it is ruined. However, if the bad stuff has been completely eradicated, then the site should be able to stand some neglect, with perhaps just an occasional prescribed burn. (But don't count on burns to get rid of the invaders! This won't happen.) Even more important: if all invaders have been eradicated, it becomes a very inexpensive process to remove the few new ones that move in from outside. One or two passes through this blissful preserve may be all that is necessary each year. For instance, if the goal is to provide habitat for grassland birds, then large open areas are critical, but they may not need to be completely weed free. Indeed, some of grassland bird species seem to be reasonably happy with alfalfa fields, as long as they aren't mowed too early. But if the goal is preservation of rare plant species, then small sites with high botanical quality will be more important. Almost any prairie or savanna restoration project ends up creating lots of brush piles. 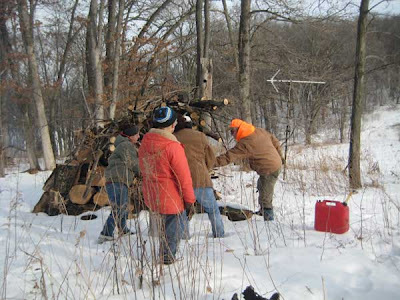 One or two piles might be left as wildlife habitat, but if you have a lot of piles you must get rid of them by burning. This is the time of year to burn brush piles. Here is the regulation, copied directly from the Department of Natural Resources web site: "For areas where the ground vegetation is completely snow-covered and will remain so for the duration of the burn, a DNR burning permit is NOT required. You may burn at any time, on any day." We also had about a dozen smaller brush piles that were left over from the East Basin restoration. These were easier to deal with. The safe way to light such a pile is with a good supply of drip torch fuel (2-3 diesel to 1 gasoline). We carry the fuel in a stainless steel sprayer which can be pressurized and has a long brass wand. A little fuel is first dropped inside one edge of the pile and a lighted match tossed in. Since the fuel is mainly diesel, it isn't too flashy, although the person with the match must be quick to pull back. Once the starter is lighted, fuel can be sprayed farther into the pile, driving the fire with it. 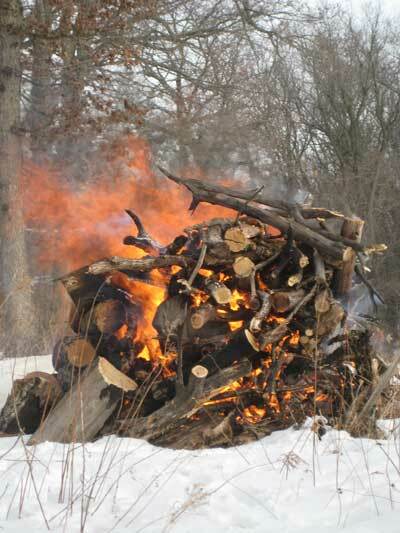 With dry snow-free wood, a pile usually starts burning quickly. The pile in the photo to the left, for instance, was lighted about 10 AM and after lunch was mostly burned down. It is good to get all the piles started in the morning since it takes quite a while in the afternoon to consolidate the remains of each burning pile. 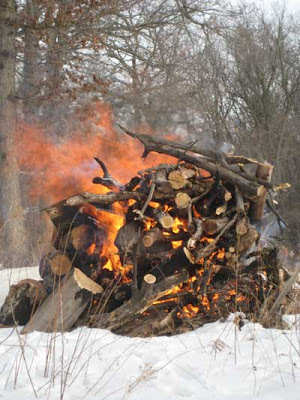 It helps to have a pitch fork or heavy shovel to pick up any burning pieces and toss them into the center of the pile. (Leather gloves are essential!) Usually, if all the burning pieces are piled in the center, the following day there should be nothing left except ashes. I am often asked what effect the fire has on the soil underneath. Is the soil sterilized, and will any plants grow? Actually, there is little harm. Soil is a poor conductor of heat so that only a thin area on top gets very hot. 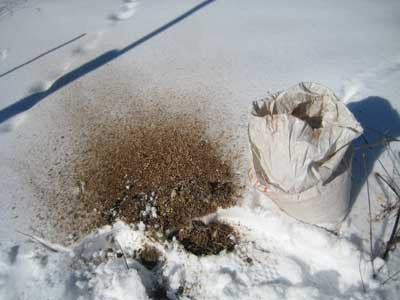 The main problem is the residue of ashes, which keeps seeds from reaching the underlying soil. We use a good leaf blower to scattered the ashes, and then plant the burn scars with a good prairie or savanna seed mix. Within a year or so, there will be no trace of the burn sites. Now that we have finished the tree database, it is possible to start making interesting queries using GIS. The topic today is big trees, those greater than 30 inches in diameter. It is a simple task to write the code for this query: "Diameter" >=30. Then one must go to the Symbology tab and select the "species" category. 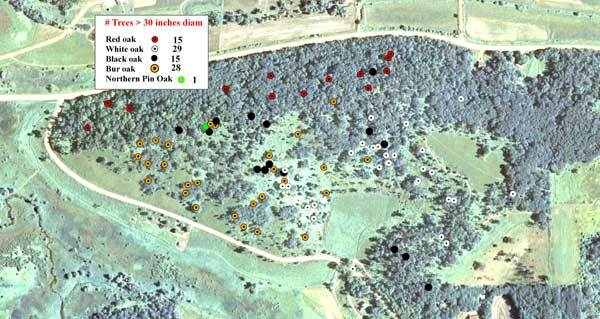 With a few clicks, it is possible to show each large tree species with its own symbol. I am sorry this graphic isn't larger and clearer, but the Internet has massive file-size limitations. The TIFF file that was used to create this graphic was 64 MB! However, it should be a little clearer if you double click and get it in its own window. It is impressive to think about all these large trees surviving so long. Those over 40 inches in diameter, for instance, are probably over 200 years old! There are many highly degraded sites in southwestern Wisconsin that have large trees like ours hidden among the invasive trees and shrubs. When we started restoring Pleasant Valley Conservancy, we were hardly aware of how many large trees we had. Once the invasive shrubs and the walnuts, elms, cherry, and weedier black oaks started coming down, we were able to see what our natural area could look like. 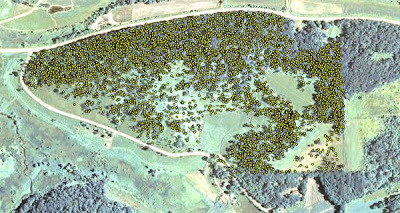 If you are interested in studying the distribution of large oaks for a particular property, look at its 1937 air photo, now available on line. As an example, take a look at the 1937 photo for Pleasant Valley Conservancy, at this link. In an earlier post I described some of the information we had obtained about Hill's oak (Quercus ellipsoidalis, also called Northern Pin Oak). Now that we have completed the tree database, I have been able to look at the distribution of Hill's oak using GIS. 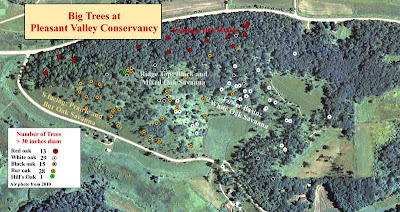 The photo above shows the distribution of the different size classes of Hill's oak at Pleasant Valley Conservancy. There seem to be only two areas here where Hill's oak is present, quite far apart. There are more trees in the group at the eastern end (105; just east of Toby's Prairie) but they consist of primarily smaller trees, although there are a few large ones. There are 49 trees in the group at the western end, at the upper part of the north woods hill, most of which are large sized. Since the trees at the eastern end are at a lower elevation and are close to the woods road, it is possible that the larger ones here were logged sometime in the past. As I pointed out in my earlier post, Hill's oak is found primarily on dry, sandy sites, and it is lots more tolerant of drought than other oaks. This fits with the character of the soil east of Toby's Prairie, which is quite sandy. Hill's oak is very shade intolerant and is unable to reproduce under its own shade. It is also well adapted to fire. Here's what they say in Michigan about Hill's oak: "It’s just a rather rare oak and rarely cultivated to any extent. We have found this oak similar to a good black oak-Quercus velutina. It transplants easy, doesn’t have iron deficiency issues like pin oak and the leaves are very glossy and look great throughout summer. Grows well in well-drained upland soils and on clays and can be found on the borders of lakes and low woods. Wood is heavy, hard, and coarse-grained. Source of acorns for ducks with this species. Height to 50-60 ft. with a 70-80 ft. [root] width. Hardiness -30 °F." Don't be confused about the taxonomy of Hill's oak. There is another pin oak species, Quercus palustris, that is found south of us, and all through the eastern United States. Taxonomist Andrew Hipp, who has done a lot of DNA research on oaks, calls Hill's a Western Great Lakes endemic. In future posts, I'll be presenting some more of our tree database data. The tree database has been completed! 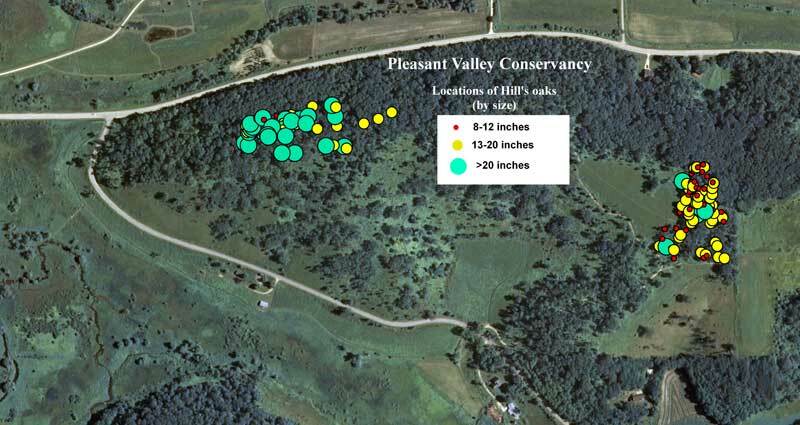 In 2007 we started creating a database of all the trees at Pleasant Valley Conservancy that were larger than 10 inches in diameter. Each tree received a permanent numbered marker and its species and GPS coordinates were measured. We started in the White Oak Savanna (Unit 12A) and then moved systematically across the preserve. First along the south-facing slope, then the ridge-top savannas, and finally the north-facing woods (where most of the trees are). This was primarily a winter job. Heisley started this and when she moved on Amanda continued it. Just last week she finished. Over 4000 trees! The database, a large Excel file, has been brought in to ArcGIS, and is now ready for some major analyses. I've been using the data as it became available, and last year I used the data to calculate crowncover for the savanna areas. But the full database has lots more uses. I'll show some more results in a later post, but here (photo above) I want to show what the whole database looks like. Unfortunately, the resolution useful for a web site is fairly low, making the image pretty poor. (Double click on the image to bring it up a bit larger in its own window.) What the photo shows is the location of every tree in the database. The second image, below, is a little better. 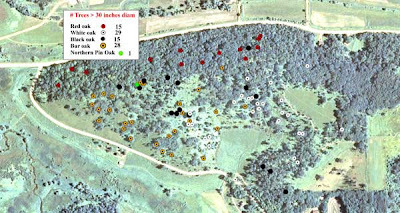 What it shows is the location of the large trees; every tree larger than 30 inches in diameter. Each species has its own color, and I hope the resolution is enough so that the names are visible. Also, the number to the right of each species name in the box is the number of specimens of that species present at Pleasant Valley Conservancy. There are 29 white oaks and 28 bur oaks. We put up two kestrel nest boxes in 2008 and since then have been successful with the one closest to the cabin. It has been a delight to watch the birds'comings and goings from the porch, especially at lunch time. They have raised young each year, and last year they may have had two broods. Since kestrels may winter in these parts, or at least start looking for nest sites in February, we try to clean the boxes out early. Sunday, a nice sunny day, Kathie and I did this chore. The boxes are mounted on long, articulated poles, and to clean them we have to take out a bolt and swing the pole toward the ground. Because of the long pole, it is a little tricky to get a box down. I held the box while Kathie scraped out the "junk" with a putty knife. It's pretty smelly stuff. We then resupply with fresh wood shavings. 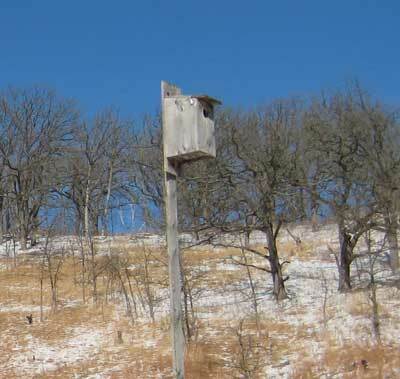 I found the design for these boxes on a web site, but the hinged mounting arrangement came from Mark Martin at Madison Audubon's Goose Pond Sanctuary. We have ideal kestrel habitat. They are primarily fly catchers, and feed over open, treeless ground. Our boxes are installed next to the wetland, and the kestrels fly generally back and forth between the box and some dead willows along the creek about 500 feet away. They also often fly up toward the south-slope prairie remnant and savanna that can be seen in the top photo.